I wasn’t much into Christmas this year. Too much going on, too many stresses I think. I spent some time today taking down all the decorations. The only thing left is the tree in the living room. And this time, I have repacked items a lot better and wound up with two empty cardboard boxes. Should be easier to find next year anyway. I didn’t send out any cards at all. I’m sorry. I know some people look forward to the handmade cards I send, and I did have plenty of materials to work with. I didn’t have time, inclination or much holiday spirit. I mean, I hardly took any pictures. Oh, don’t get me wrong – I did enjoy spending the holiday with my family, the kids, and seeing everyone eat (it’s how I show my love) . But we’ve had tons of drama over trying to sell our house to frustrating buyers (mostly un-blogged), and I’ve been working my hiney off. .. working. I had a big client I did some consulting with and I earned us some money. I was running around the house doing everything I could, and while stressful, I somehow managed to loose three whole pounds on top of that. I am looking forward to the new year. Not just to throw off the past year, which has mostly not been fun at all, but because there are new and exciting things coming up, some new directions to go in some details to finalize and projects to launch. Edit: Dang, I pasted code in the wrong place. Sigh. I didn’t have the chance to update earlier with a story of Emma’s Christmas shopping. She was browsing a mall kiosk of knick knacks and a confusing mush mash of goods, looking for something for her brother. She was entranced by the display of geode rocks, all sparkly and the clerk was smiling down upon her. Emma flipped the rock over, read the pricetag, yelled “FIVE DOLLARS?” and slammed it back on the table. So ever since then, we’ve been yelling “FIVE DOLLARS?” at random intervals. Santa made the rounds on Christmas Eve when people were going to bed. He read Emma a story, gave mommy new jammies and kissed her soundly in the hallway, much to teenage disgust. Addison and Kaytlyn also brought up their Wii, so we’ve been playing that quite a bit as well. – K got A a DVD of the Historical minutes. We got him Steven Cobert’s book. 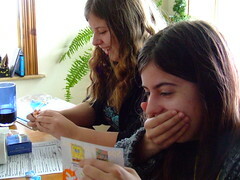 – Ron got FOUR Tim Horton’s gift cards, a marble run toy and some magnetics. Plus a temperature gun. In discussing her birthday options, I asked Emma what kind of cake she wanted. 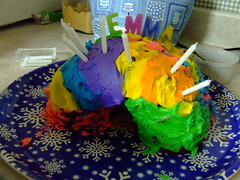 “A rainbow cake,” she said. My mind wandered around thinking up designs I could do on a flat sheet cake and I wondered if I could get clear gel icing somewhere..
And although it turned out rather cool, I hadn’t seen that episode and I never looked up the info until today, when the cake is pretty much decimated. If you hurry, you might get the last slice or two. I made the cake my own way, with what Emma said. She was pretty much dead-on with the directions, but I swirled a toothpick dipped in paste food coloring throughout the batter, instead of dividing it up and coloring it. 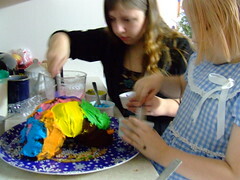 For the icing, I let her pick the colors (all we had except brown) and I let her ice the cake too. It was great fun. Yes, everything was homemade, and I used our new bubble gum flavoring in both the batter and the icing. It is especially good in icing. Her day had started with a present left in the kitchen, because she wanted to open something first thing in the morning, since she missed her daddy. He got her Where The Wild Things Are, which I found great because it was odd we didn’t actually own it already. “Oh, and it won a shiny gold award too!” she said, when looking at the cover. Reading it has already given her strength against the monsters that lurk in dark corners. 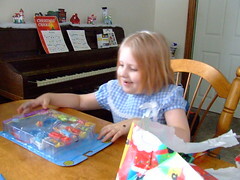 At lunchtime, where Daddy was amiss because of the weather, she opened her presents from Sarah and Meaghan. A polly pocket set, complete with a BOY. A Spongebob DVD from the latest season. I think it was more than just Emma who enjoyed things. 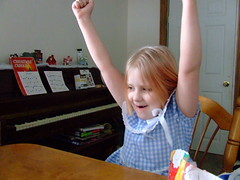 Later after supper, she opened the last present from Mom & Dad – Shrek 3. We all sat down to watch it over dinner, and paused it to bring out the rainbow cake compelte with candles ablaze. She said she had the best birthday ever, just like she said last year. Mmmm, birthday cake for breakfast. 🙂 Before I get to the entry itself (busy day, as always) here’s the link to look at all the pics I uploaded. There’s some bonus Christmas tree pics there too. Yes, I have two trees – one purely for looks because I am spoiled.